This is the third of my French themed posts. I was on the look out whilst in France for unusual or interesting things and I managed to get my hands on a few, very everyday yet beautiful things. 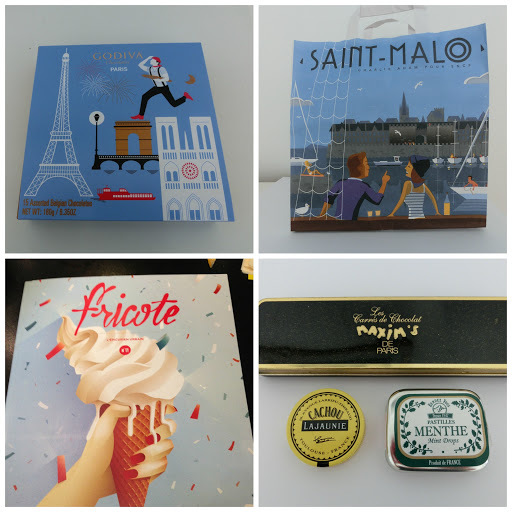 First was a Paris themed box of Godiva chocolates with illustrations from graphic design students from La Cambre, the most prestigious art and design school in Belgium. Can you believe the neuxt was just the bag our breakfast came in from the TGV buffet – so art deco and so perfect? Whilst browsing in Relay newsagents at the station my eye was drawn to Fricote magazine. This beautifully quirky magazine is about creative food trends and written in both English and French. As I only have this one issue I am almost afraid to finish reading it as it is so special. Their website is pretty cool but in French only. Finally a little selection of pretty little sweet and chocolate tins, the exterior eclipses the contents. 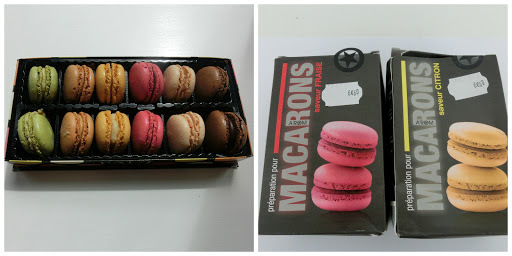 Who could go to Paris without buying macarons? The box on the left were bought from Paul at the airport and I later spotted a Ladurée concession but couldn’t justify the price (by the way their website is adorable). Last winter I bought a packet mix for macarons from Galeries Lafayette in Berlin and I was beside myself to spot a similar selection at my parents’ local garden centre. At 7€ for 30 who can say no? Now I can finally use my macaron baking sheet I got for Christmas.